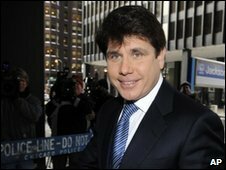 Former Illinois Governor Rod Blagojevich has pleaded not guilty to revised corruption charges. The charges include trying to sell President Barack Obama's vacant Senate seat. The revised charges were filed after concerns that the original charges were too vague. Mr Blagojevich, who intends to take the witness stand, wants the court to hear 500 hours of taped phone conversations to prove his innocence. Prosecutors say that in the conversations, recorded by the FBI, he attempted to sell or trade Mr Obama's seat. Mr Blagojevich, who was impeached last year, told reporters after a five-minute hearing on Wednesday in Chicago: "Let me cut right to the chase, today I'm laying down the gauntlet. "I'm not just going to talk the talk, I'm going to walk the walk," he added. "Play the tapes, play all the tapes." The trial is due to start on 3 June. Other corruption charges relate to demanding donations from potential campaign contributors in exchange for favours.